For the first edition, not to be confused with New Edition, we are going way back to the glory days of 2005; UFC 53: Heavy Hitters. First off let’s just say rest in peace to Evan Tanner, one of the most respected and long-lasting fighters of the old era, finishing his career at 32-8. 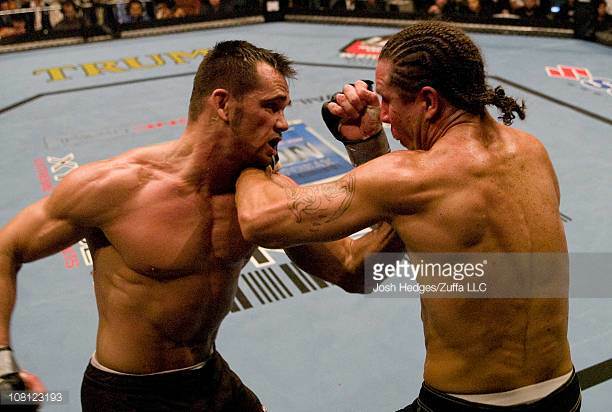 Franklin versus Tanner II was the 10th fight in Rich ‘Ace’ Franklin’s UFC career, his first shot at a title and interestingly enough a rematch of his debut with the promotion, in which he KO’d Tanner in just 2 min 40 seconds. This stopped a four-fight win streak for Tanner, whom following the loss defeated Phil Baroni twice and then triangled Robbie Lawler after that. Tanner had claimed the vacant Middleweight Belt just four months earlier via first-round TKO over David Terrell. Meanwhile, Franklin (at this point still pre-pink shorts Rich) had gone 7-1 since they last met, only losing to Lyoto Machida in Japan. Rich had taken Ken Shamrock to task at 205 lbs. just two months prior (which some say was fixed), and was becoming well-known for his ability to finish by TKO or submission. In fact, at 19-1 before this bout, all of his victories were stoppages. This trend would continue with 21 straight wins from finishing his opponents, until beating David Loiseau at UFC 58. By the end of the Ace Ventura look-alike’s career, 25 of his 29 wins came before the final bell. With a spritely Herb Dean reffing the match and a Trump Casino ad on the mat, Tanner comes out across as both fighters look to glance hooks off each other’s chins. Two minutes in, Franklin seemingly stuns Tanner with a left hook while his opponent leaned in. Franklin, determined to score with hooks and body kicks, keeps attacking with his left side. At three minutes, the youth of the sport shows its face as fans start booing. Possibly because at this point in an earlier fight, Matt Serra had already face-planted Karo Parisyan. Just as it seems Tanner’s combination attempts aren’t working and Franklin’s counterpunches, hooks and body shots are, Tanner drops Rich with a straight right with 37 seconds left. Franklin recovers hella quick, and surprisingly ends up on top. For that reason, along with octagon control, more shots landed, I would give this round (very narrowly) to Franklin 10-9. Despite Tanner bleeding from his ear, Eddie Bravo (yes, Eddie Bravo) let’s us know that last exchange won the round for Evan in his mind. Tanner almost seems to be running away from Franklin’s kicks to start the round, but uses a miss to gain top position via a sloppy takedown. As commentary is clearly muted while something is discussed (lol), Rich hangs on for dear life going back and forth between butterfly and guard before eventually muscling his way back to his feet. As the two look to counter, Franklin’s odd, outside-handed right jabs that seem awfully pointless end up getting him tagged with another Tanner right, which Joe Rogan is adamant about not over-using. Whilst Tanner’s face begins to bleed, he lands another big right only to have Rich respond with a couple of knees in the clinch. Despite a leaky faucet, Tanner’s significant strikes and take down gives him a 10-9 in my books…sorry Eddie. The third round starts with a shot of Tanner’s girlfriend looking concerned, foreshadowing perhaps. Franklin lands several clinch knees, as we begin to see his famous cardio first shown in UFC All Access; which was also a blatant excuse to see Rachelle Leah in her bra right away. A minute and a half in Rich rocks Tanner with a left that has him stumbling against the cage, followed by another knee as everything seems to be falling apart. The blood is compiling and he seems obviously more tired as he takes damage. Classic hooks force Tanner to shoot, resulting in Franklin controlling his neck for the better part of a minute. As the time dwindles on the round Franklin gains more and more confidence; lowering his hands, throwing fancy lead jabs, only to follow with big left hooks and prevailing knees that make this round an easy 10-9 for Rich. Tanner has a purple mouse under his right eye, Franklin’s corner is telling him it’s actually the third round, and the Octagon Girls apparently would dance sexily when the crowd cheers back in these days. 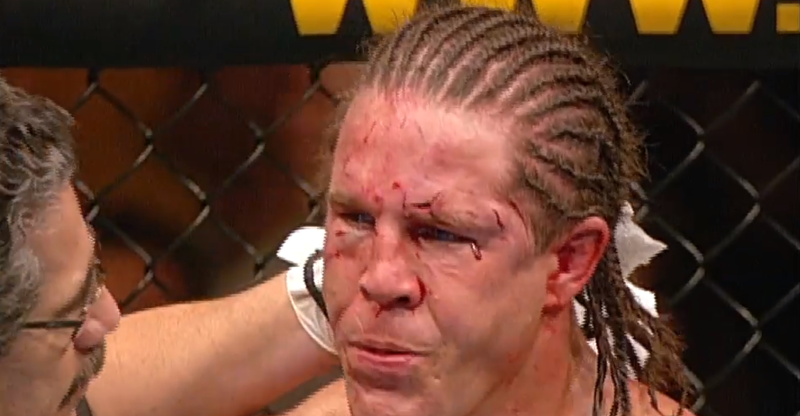 “Evan Tanner’s face is a mess,” Rogan points out, and it’s likely about to get worse. The Ohio native rushes out with a head kick stumbling Tanner leading to him dropping, again with Franklin taking control of his neck. Some sloppy stand up follows, as Tanner leans against the cage and goes for an equally as sloppy take down, which his opponent easily stuffs. Kicks to the body and more stuffed attempts at getting close leave Tanner confused, as he continues to push forward, exactly what his corner told him not to do as it is leaving open a lot of holes for ‘Ace’ to fill in. The Cincinnati man lands a six-strike combo with kicks, knees and hooks that has Tanner battered, but some how he still manages to push back into the centre of the octagon. After another flurry on the fence, at 1:38 remaining Herb Dean stops the fight to evaluate the cut on the champ’s face. Almost immediately one of the doctors signals to the ref that it is over, officially by TKO at 3:25 of the fourth round. Now the Middleweight Champion, Franklin defended his title twice; first against THE Nate Quarry at UFC 56 and then David Loiseau at UFC 58. Franklin will move on to the next Flashback Friday Fight of the Week, stay tuned next week to see who his opponent will be.